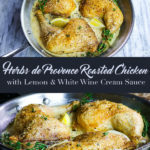 To know me is to know my love for herbs de provence. 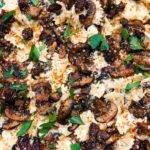 I adore this incredibly flavorful and richly fragrant herb blend so much, I put it on almost everything. 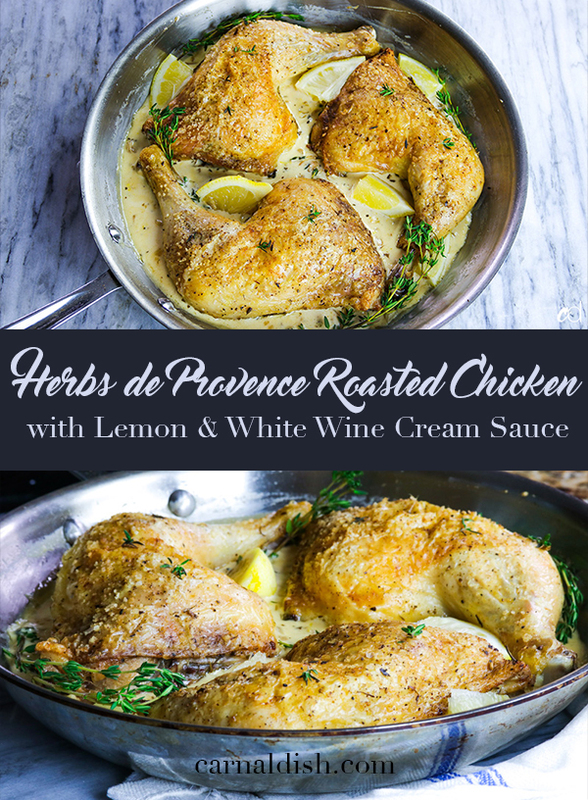 Nothing sings to me louder than herbs de provence roasted chicken. It’s a song in the key of life. Now, I’ve roasted a lot of chicken in my life, many ways, many flavor combinations. 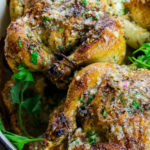 But nothing comforts me more than biting into a juicy piece of crispy-skinned roasted chicken flavored with flaky kosher salt and heavenly herbs studded with lavender. My gawd! It’s so simple, and so good. I’m getting emotional, not even joking. This stuff tastes like a hug to your soul with a pinky in the air. Apparently, I’ve put a lot of people on to herbs de provence via social media. Wonderful people from all over tag me in their photos and IG stories with their HDP purchases, telling me how wonderful it has elevated their food. That honestly warms my heart. I love being able to spread my love of food with people who are either novice or seasoned cooks. Food is the one thing that brings everyone together aside from music. So let’s talk about this chicken. 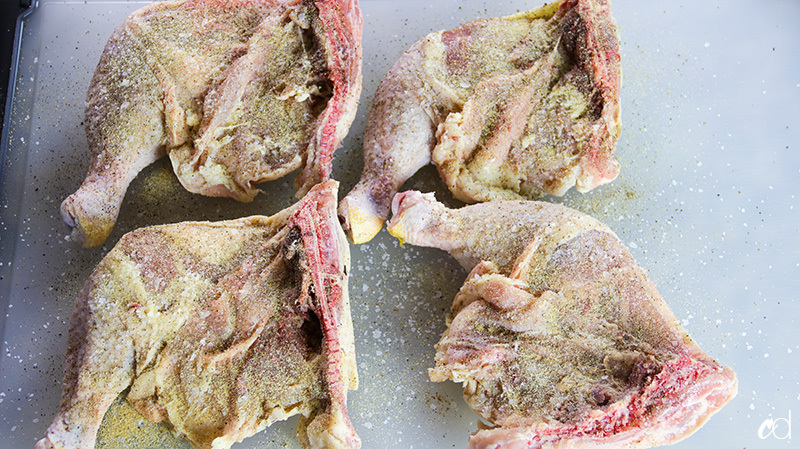 If you’re curious about trying this with a whole bird, thighs, breasts, or even wings — you can make this recipe. Of course, cooking times will have to be adjusted. 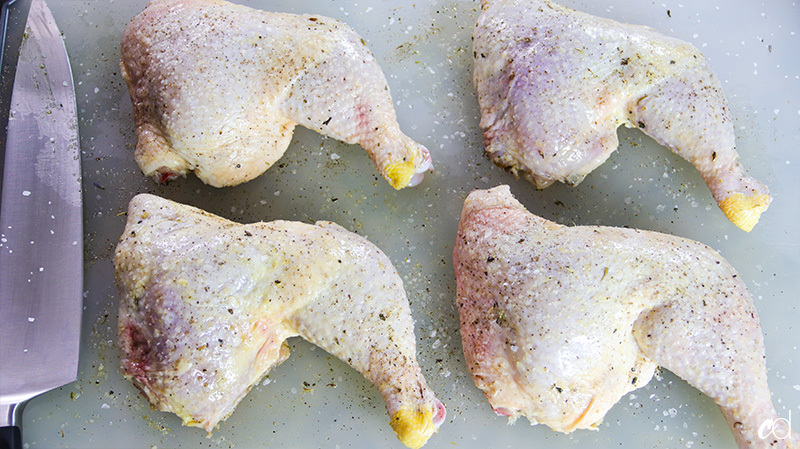 Always make sure the skin of your chicken is as dry as possible when high-roasting. We don’t want the surface moisture to steam and give us flabby, dull skin. My fiancé always jokes that he wishes I could just make him a bowl of crispy chicken skin to snack on. To me, there’s nothing more delicious than biting into juicy meat with a crisp, crackling salty piece of chicken skin. Whewwwww!!! 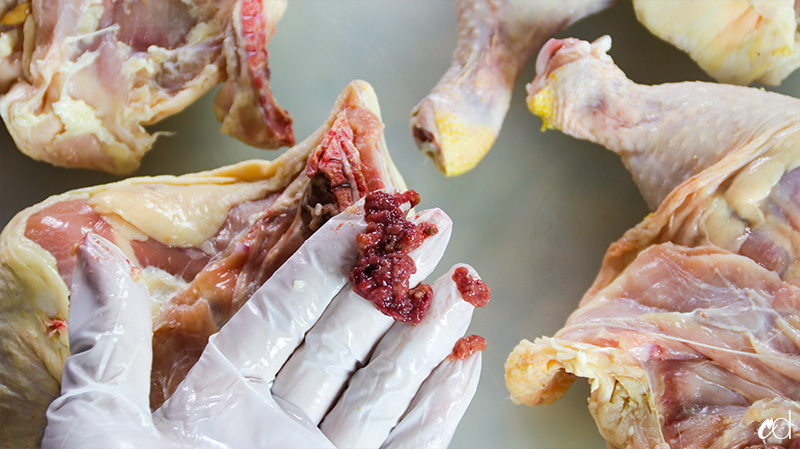 Some of the following photos are admittedly gross, but hey — I’m not gonna sugar-coat the raw meat process. Sometimes it gets gross, and you gotta have a backbone to deal with it. 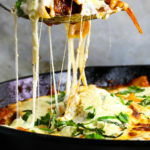 I’m used to it, but a novice cook or vegan/vegetarian may want to cry looking at this. So, here’s your warning now…do not proceed (or just scroll really fast) if you’re squeamish. 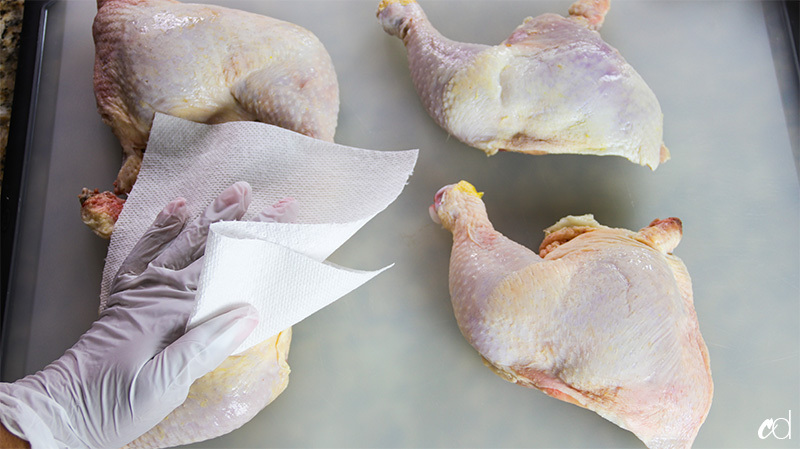 Pat the skin of your chicken dry with paper towels. Taking away surface moisture allows the skin to crisp up perfectly! Ok, now we have to do a few things to this chicken before we cook it. Flip it over, and look for any obvious pieces of fat. Take them off, we don’t need it. Here’s what the fat looks like. Looks a lot like human fat, tbh. This is where it gets gross. 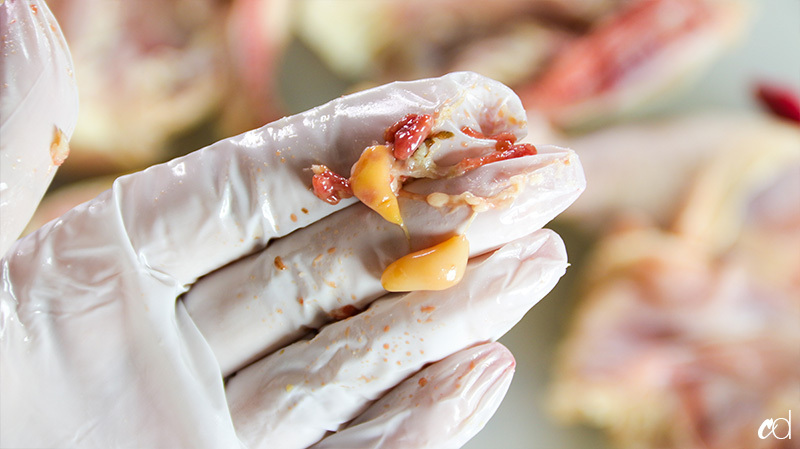 Scrape off any extra bone guts, if you feel like it. You could leave it on there, it won’t hurt you. It cooks away into tiny little brown chunks. Also yank off any residual kidney’s if you see them. Again, they’re harmless if you wanna leave them on. 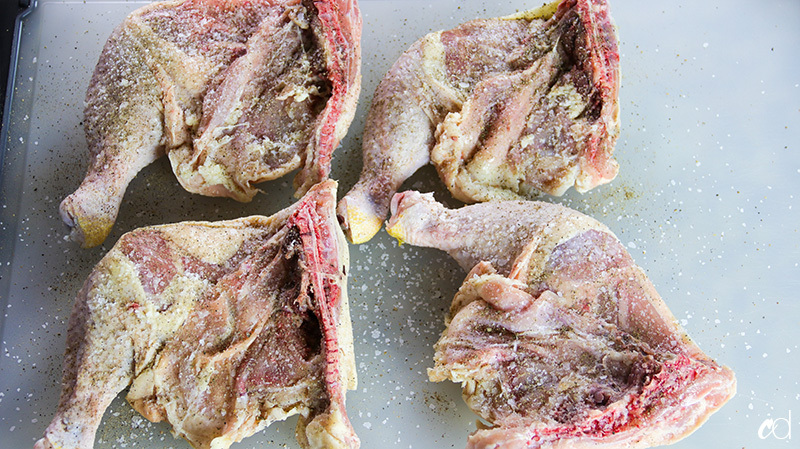 We’re going to really season the meat side of this chicken, so sprinkle some flaky kosher salt all over the flesh side. If you’re using a finer salt, use discretion. Next, layer these bad boys with some freshly ground black pepper. Grab some granulated garlic, and generously layer that on. Finally, give them a good sprinkle of that super fragrant herbs de provence. Ah! This stuff is heavenly AF! Drizzle just a little olive oil over the seasonings. 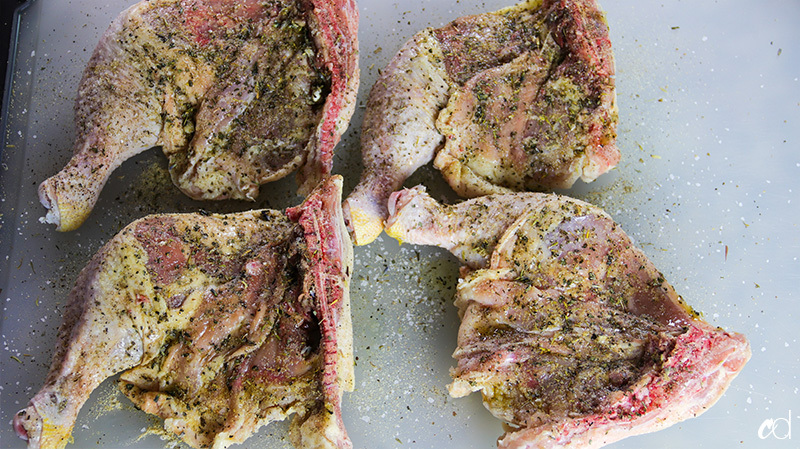 The oil helps the seasonings penetrate the meat easily, so rub it in good. All in the nooks and crannies. It should look like this. The reason we’re seasoning the flesh side is because if we put this on the outside of the bird, it’ll burn. The only thing that can withstand a high roast without totally burning is salt. Black pepper can burn, but we’re gonna add that later anyway. 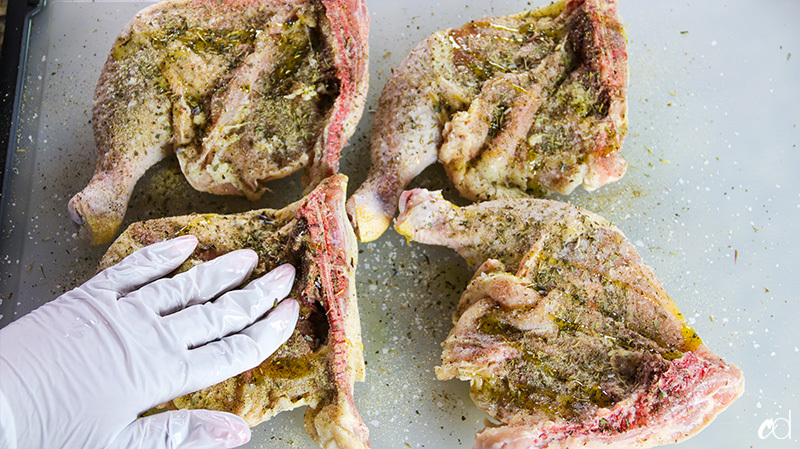 Flip the chicken back over, and drizzle just a little olive oil on the surface of the skin. 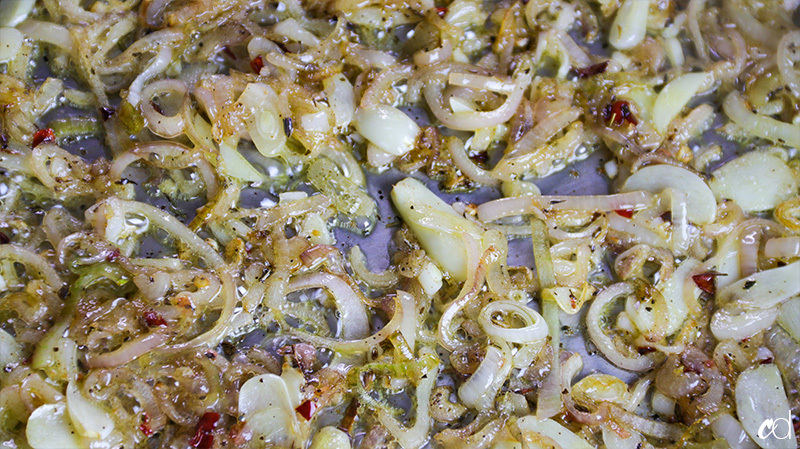 There’s enough fat in the skin for it to “self-fry” in our super hot oven, but the olive oil gives it a better color, and it allows the kosher salt to stick a little better. You can skip this step if you want. Ok, so the way I cook is totally out of order. Sometimes I do things I should have done 10 steps ago, 10 steps later. Case in point: I forgot to remove the extra backbone pieces, and the excess skin between the leg and thigh. See the pic before this one, and the one after this one, to see the difference. But here’s all that excess stuff I chopped off. Nice and cleaned up. Seasoned with kosher salt and a little black pepper. 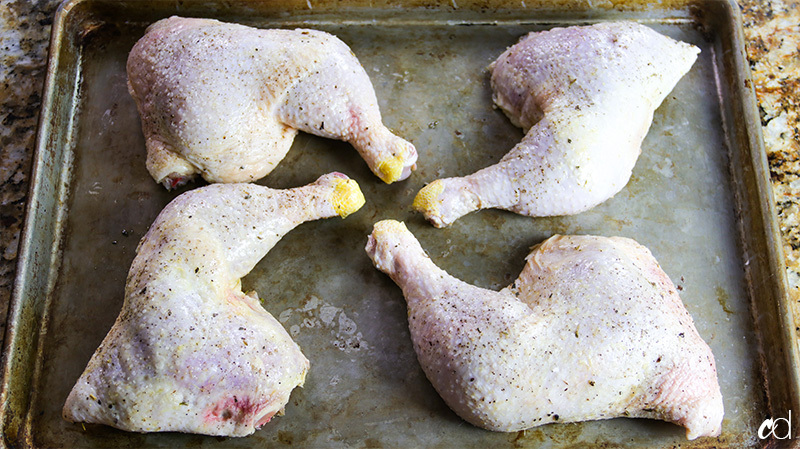 Arrange your leg quarters on your sheet pan, making sure the tips of the legs are facing inside. Why? because most ovens are hotter around the corners, and we don’t want to overcook those because they have the least amount of meat. Chop 3 shallots down the middle, lengthwise. 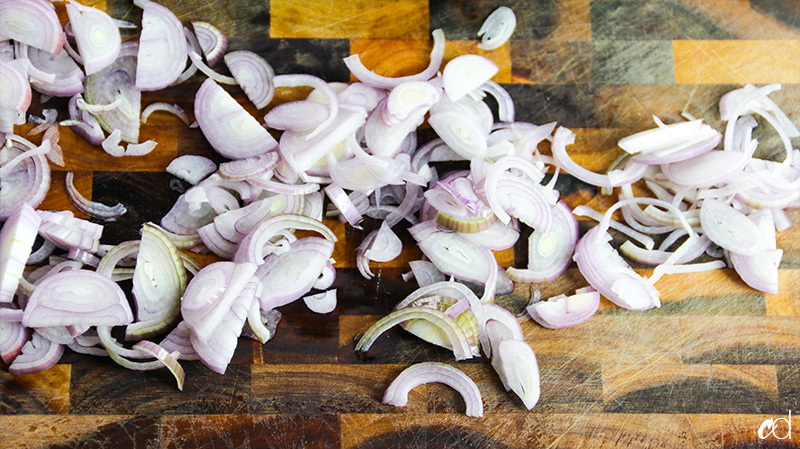 Peel the papery skins back and thinly slice the shallots. 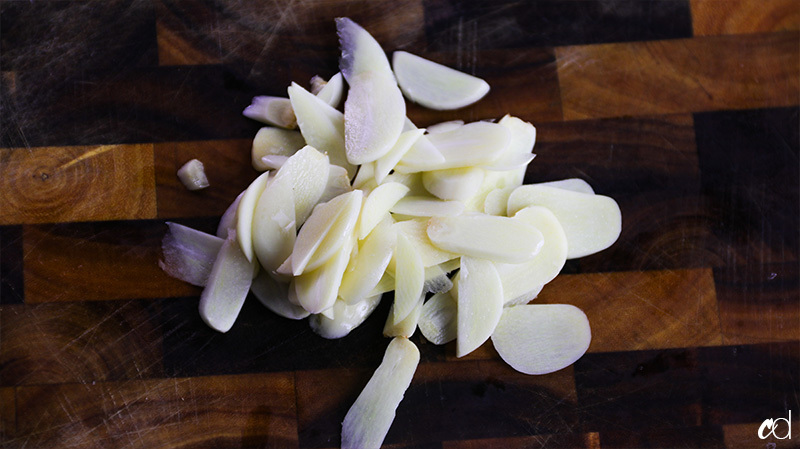 Thinly slice 4 to 5 cloves of garlic. Pluck the leaves of 3 thyme stems. 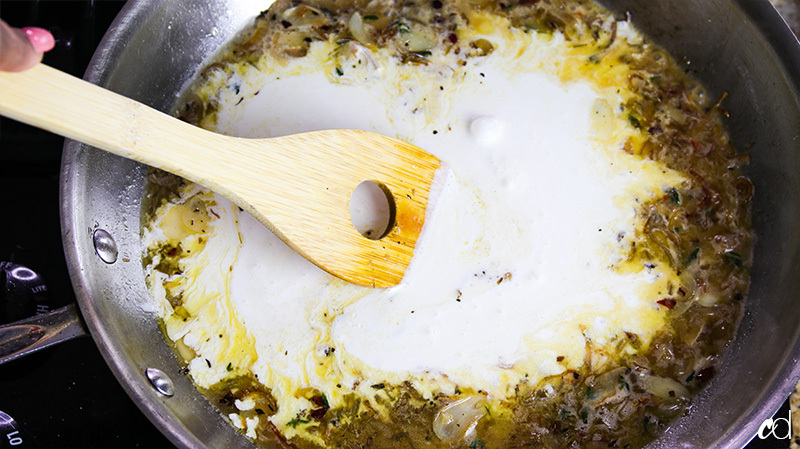 Melt 2 tablespoons of butter in a large skillet over medium heat. Throw in some herbs de provence, and crushed red pepper. 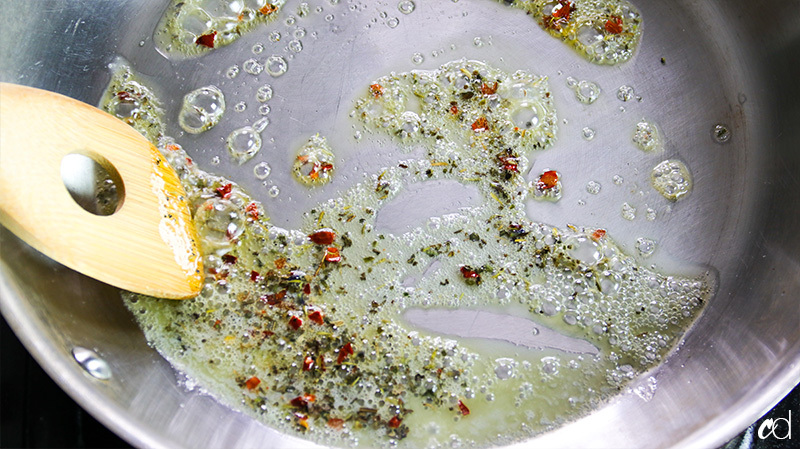 We want to bloom the crushed red pepper and herbs de provence, so help bring out their heat and flavors. This will take about a minute or two. Don’t let it go too long. 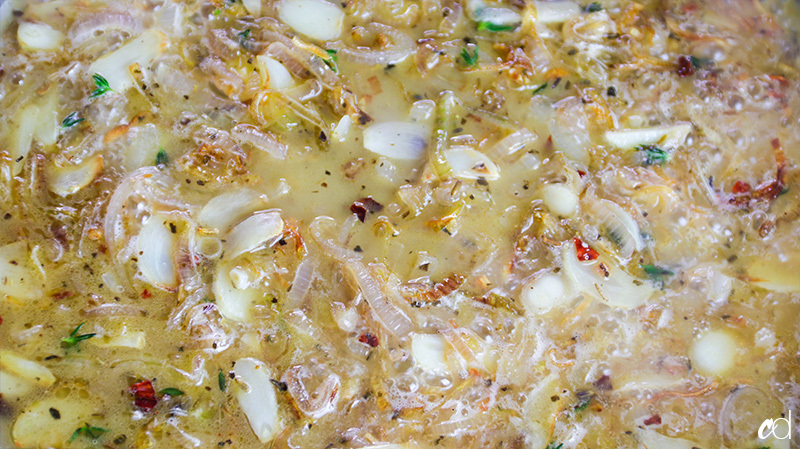 Add the shallots, and a pinch of salt and pepper. 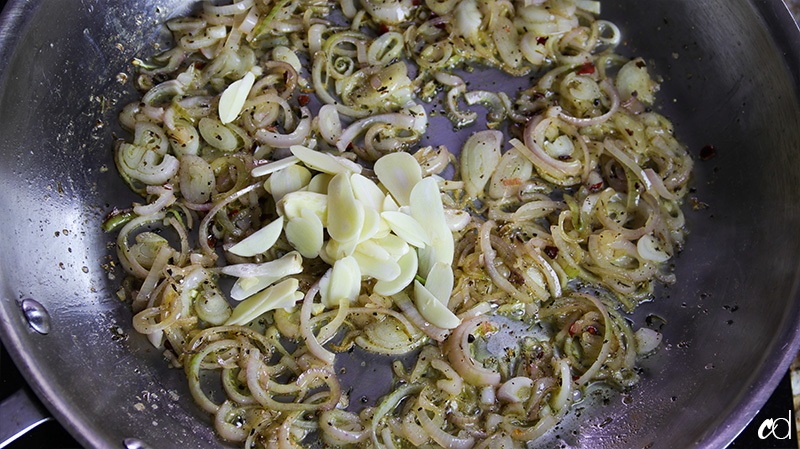 Stir all that around, adding a little more olive oil if you need some extra lubrication. Make sure you stir all that around, getting every piece of everything coated. 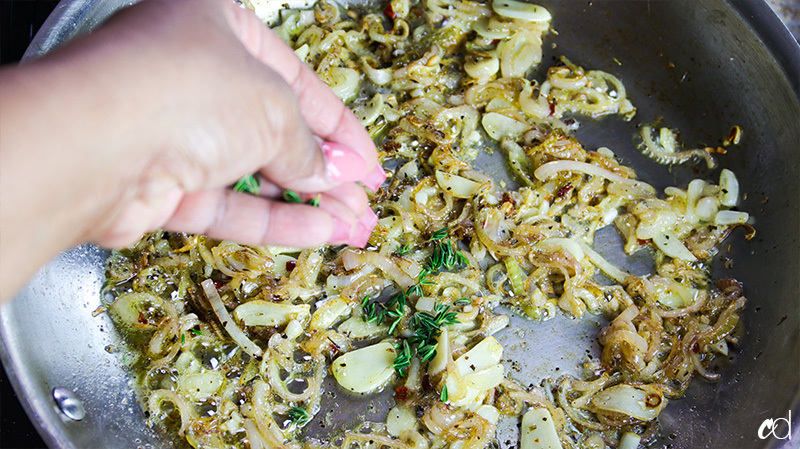 If it’s lookin a little dry, add a few drops of olive oil. I opted to add a touch more butter. This is just how I cook. I don’t follow a guide, I just analyze the subject and determine what it needs lol. 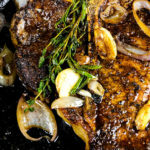 You want it to sizzle like this. 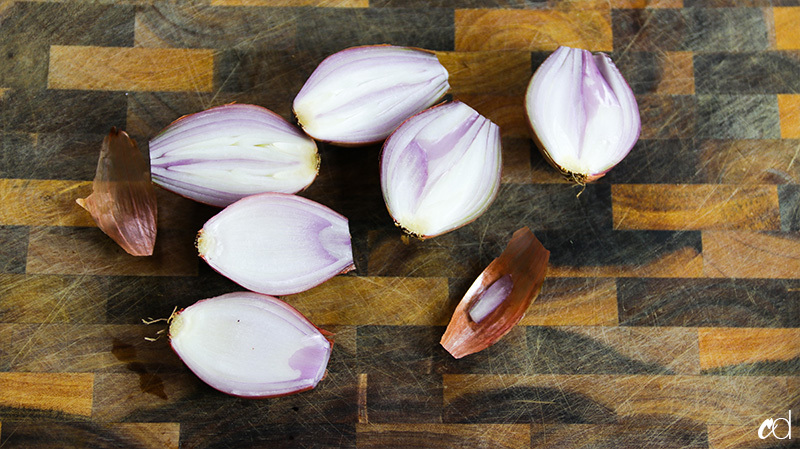 If your shallots and garlic are browning too quickly, simply reduce the heat. A closeup. It’s so pretty. I wish you could smell this, but if you’re cooking along, you already are. This step takes about 5 minutes. Ok, be very careful at this point! 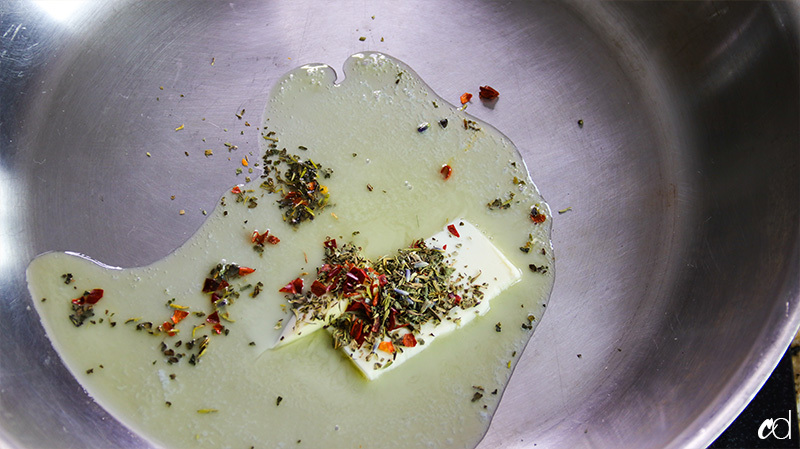 Whenever fresh herbs hit hot fat, they release a ton of water in a very violent way. Expect things to pop like crazy, but luckily, you only have to stir this for about 10 seconds. Pour in the wine, slowly. Stir the wine around, scraping up any bits if you have any. Reduce the heat to medium-low. Let the wine reduce just slightly. Just a closeup. Let this reduce for about 2 to 3 minutes, it’ll happen quick. 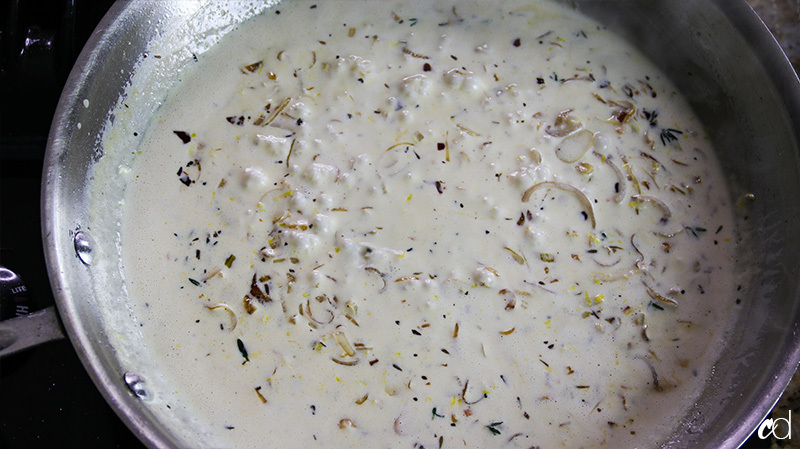 Stir the heavy cream until everything is combined. 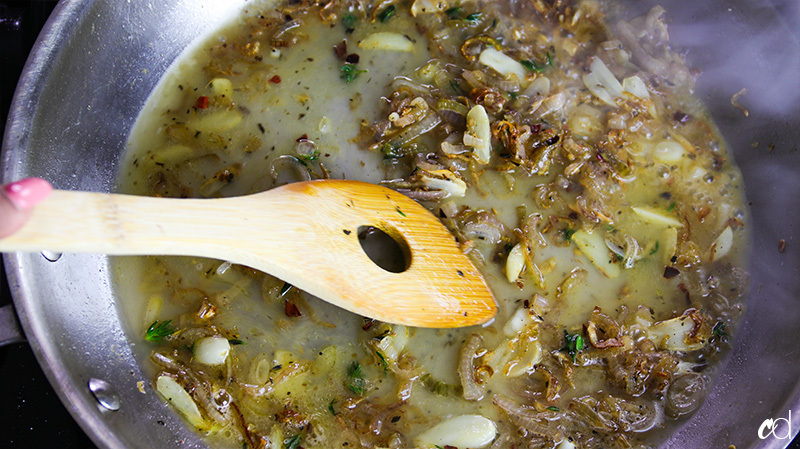 Reduce heat to low, and let this simmer for about 5 to 7 minutes, tasting along the way. Add the lemon zest, and stir it in. 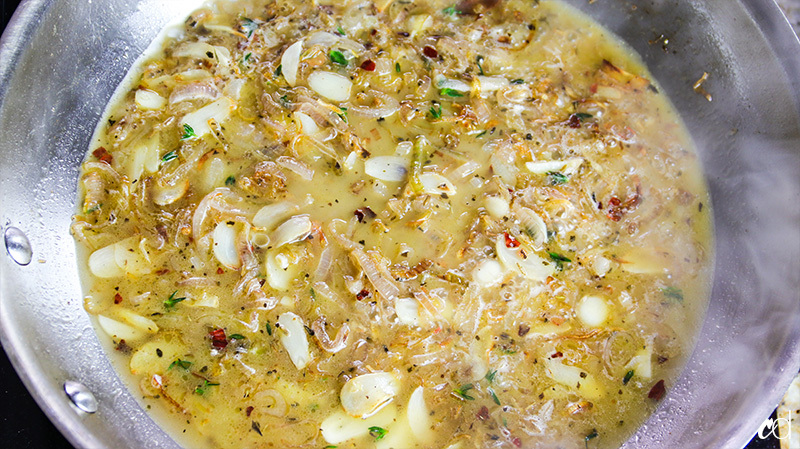 Add a squirt of fresh lemon juice, about a tablespoon. This will add a nice bit of freshness. Taste it! Does it need more salt? Now’s the time to add it. Turn off the heat and let it sit for a sec. Chicken’s done! Because we removed all excess fat pockets, we dont have a pool of grease…just a puddle lol. Let the chicken rest for about 10 minutes. 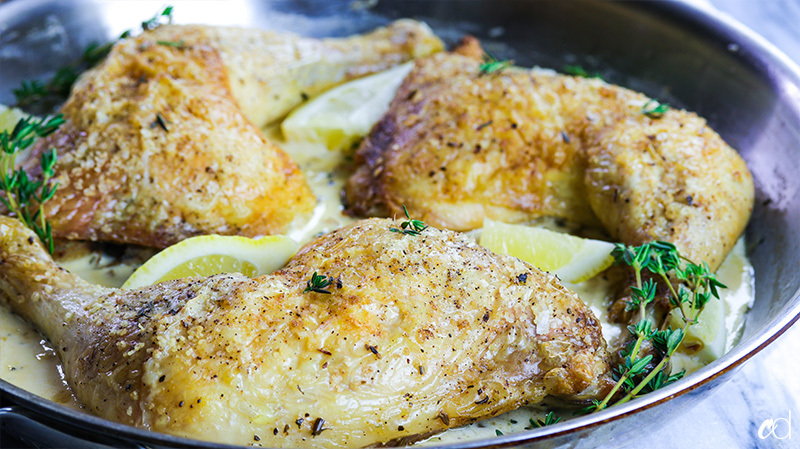 Arrange the chicken on top of the cream sauce and serve. 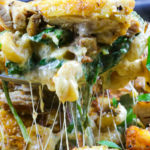 When you plate it, you’ll of course pour some of that luscious sauce all over your chicken and close your eyes in bliss. 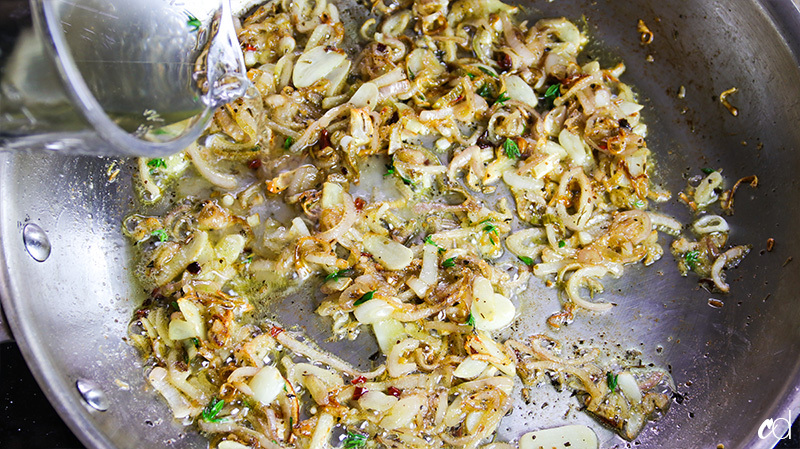 Serve this with your favorite side, or some garlicky crusty bread for sopping! 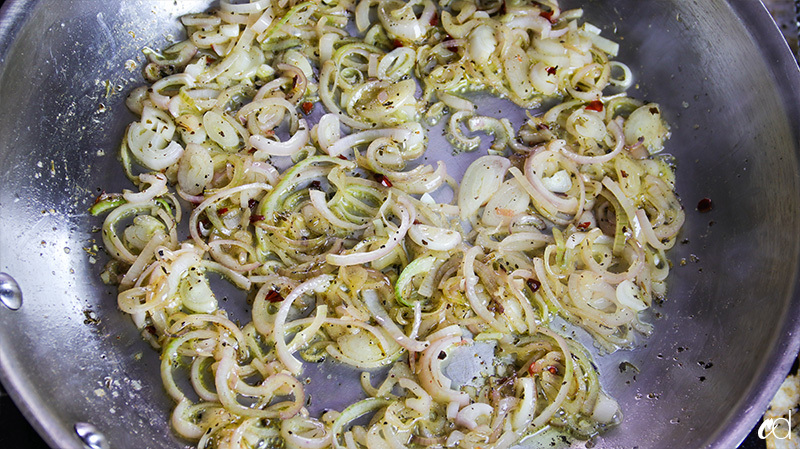 This dish is best served with your favorite sides, and a few slices of crusty garlicky bread for sopping. It comes together very quickly, in under an hour, and I cannot stress how simple and crazy delicious it is. I think this one will become one of your favorites, for sure. Enjoy, and don’t forget to pin! 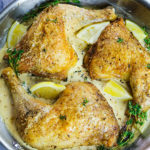 High-roast herbs de provence chicken leg quarters over a creamy lemon white wine sauce with shallots and fresh garlic. 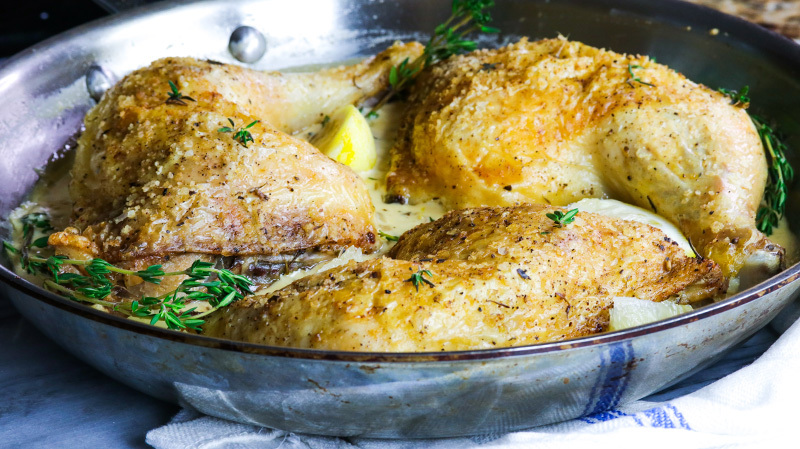 Allow chicken to come to room temperature at least 30 minutes before proceeding, it will help it cook more evenly. 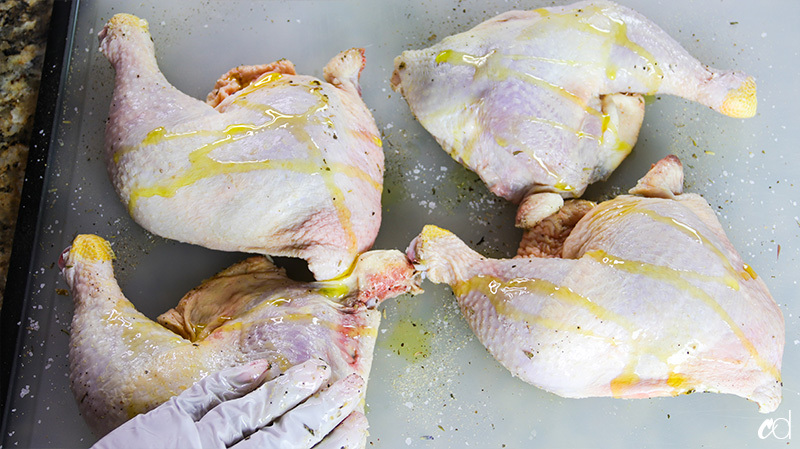 Gently rinse off chicken with cold water, removing any surface gunk. 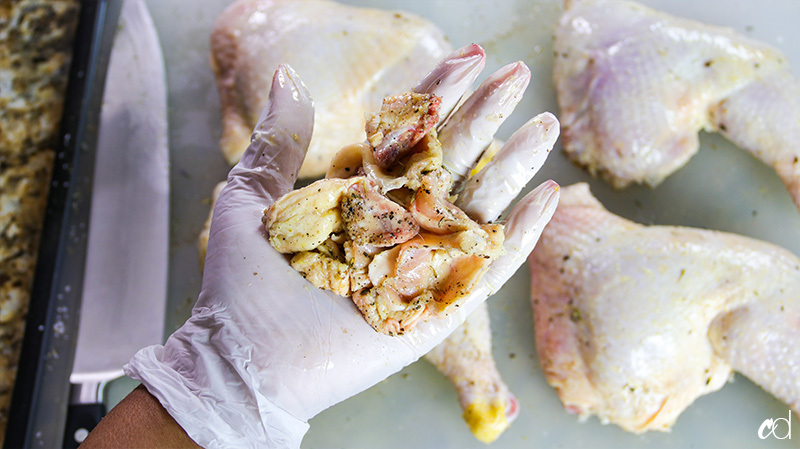 Pat skin of chicken dry with paper towels, and remove any excess skin and fat pockets. Also remove any leftover guts and/or kidney’s if needed. Place chicken skin-side down, with the flesh facing up. 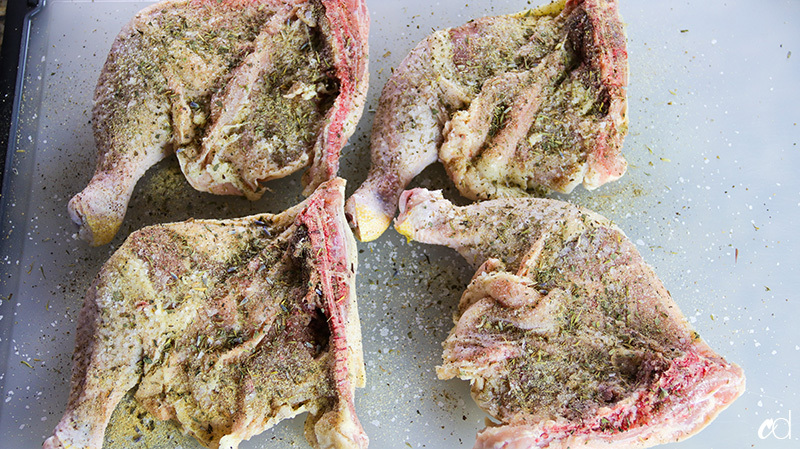 Sprinkle an even amount of kosher salt, black pepper, granulated garlic, and herbs de provence all over the chicken. Lightly drizzle olive oil over the herbs and spices, and massage it into the meat thoroughly. 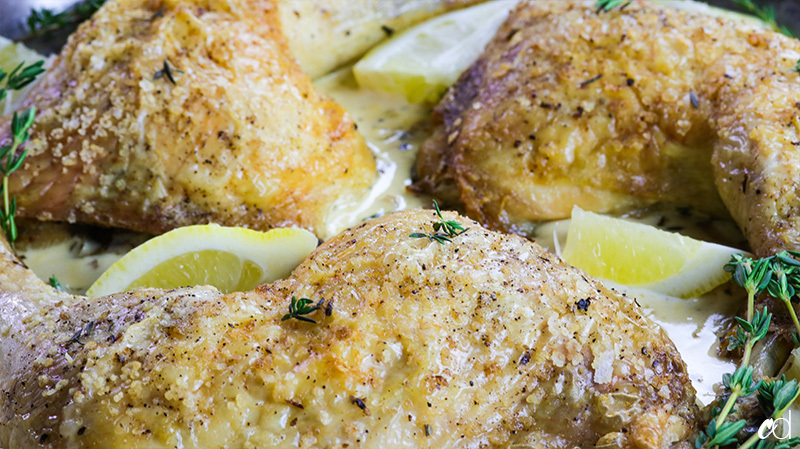 Flip chicken over, skin-side up, and drizzle a little olive oil over the skin, about a teaspoon. Rub it over the skin thoroughly. Sprinkle a good amount of kosher salt and black pepper over the oiled side. 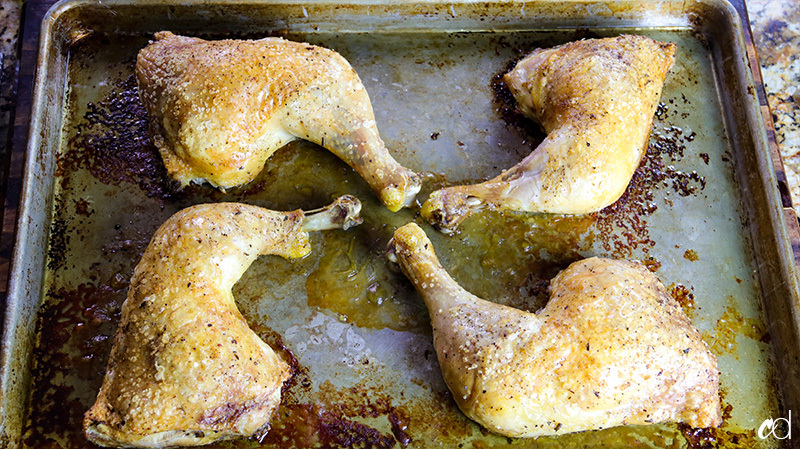 Place chicken, flesh-side down on a baking sheet. 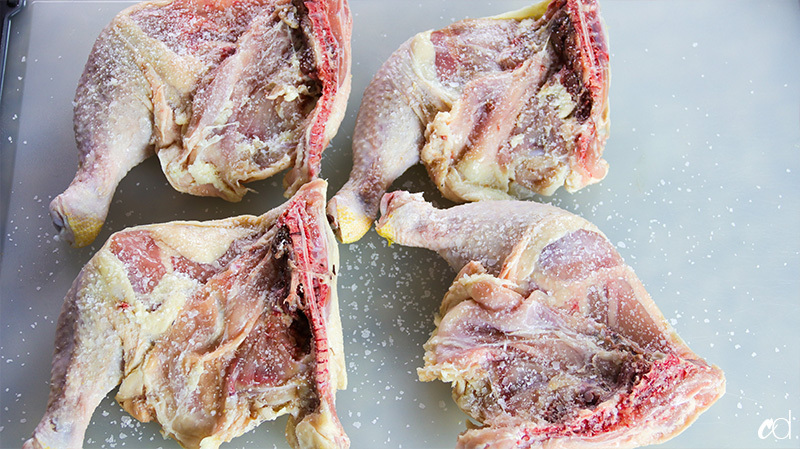 Arrange the leg quarters so that the ends of the legs are in the center, which will prevent them from over-cooking in the oven. Roast for 45 to 50 minutes, or until the internal temperature chicken reads 170 degrees, and the skin is crispy and golden. 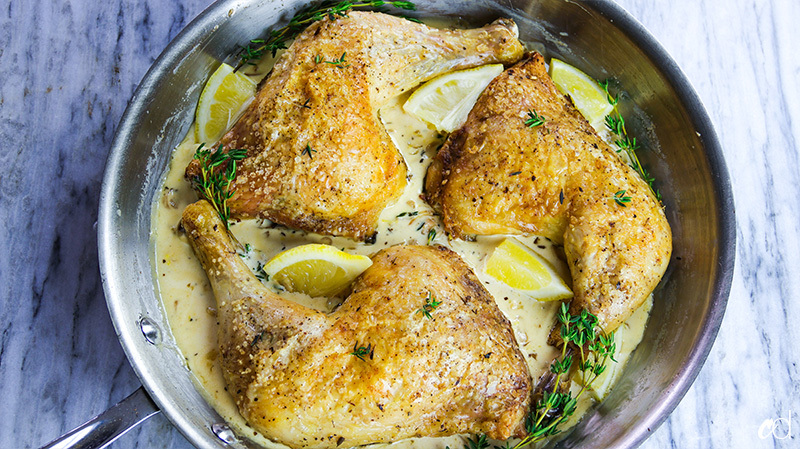 Remove the chicken from the oven and allow it to rest 5 to 10 minutes. 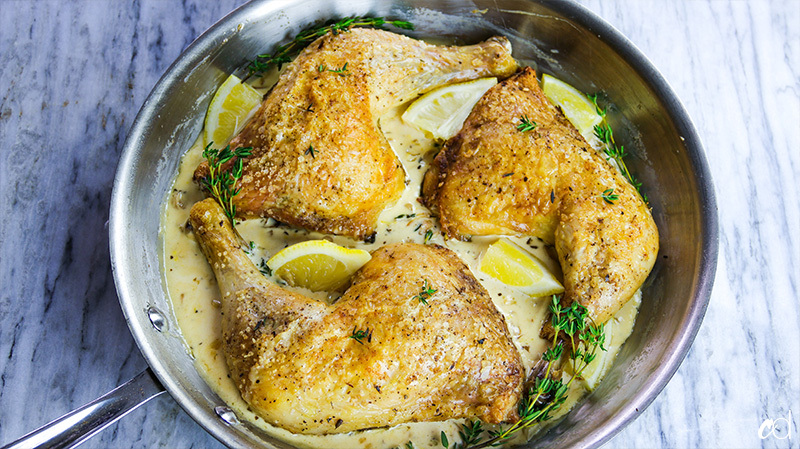 Serve with the lemon and white wine cream sauce. 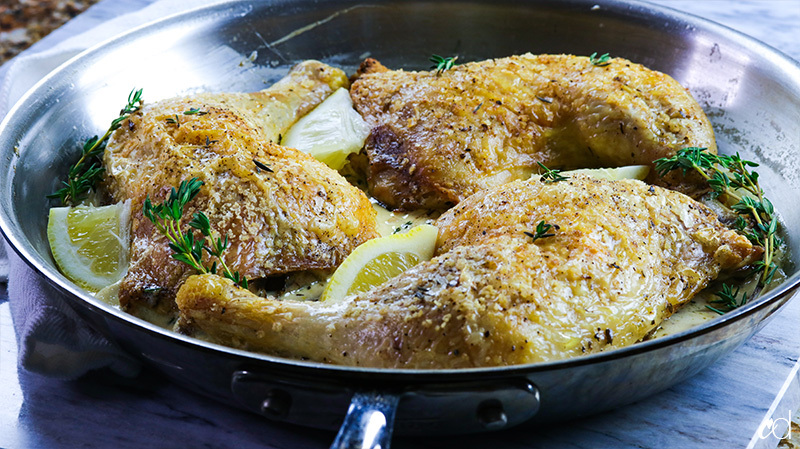 In a 12-inch skillet, melt the butter over medium-heat. Add the herbs de provence and crushed red pepper flakes. Let the mixture sizzle and infuse for about a minute or two. 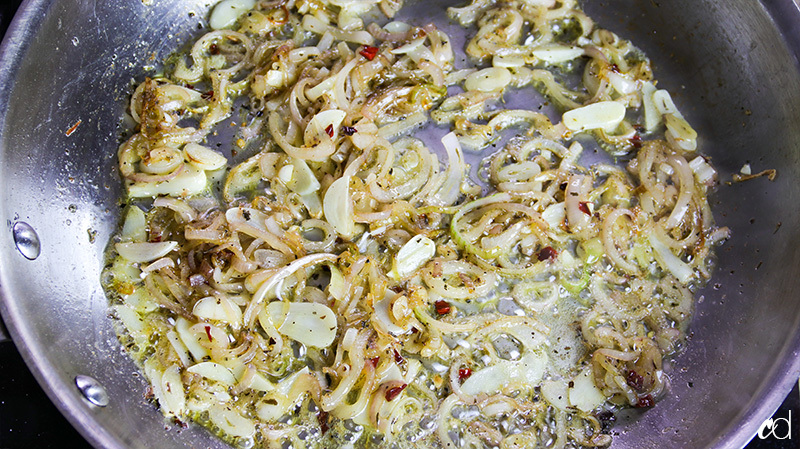 Add the shallots, a good pinch of kosher salt and black pepper, and saute until softened — about 5 minutes. 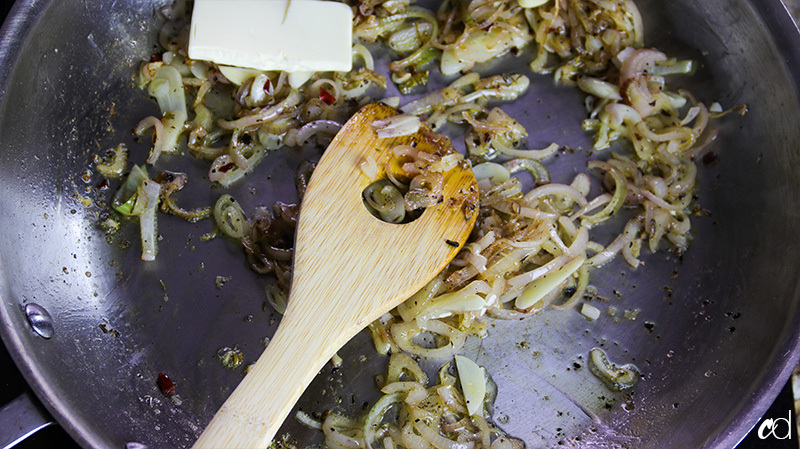 Add the garlic, and continue to saute for an additional 3 minutes, or until the garlic is a very light toasty brown around the edges. 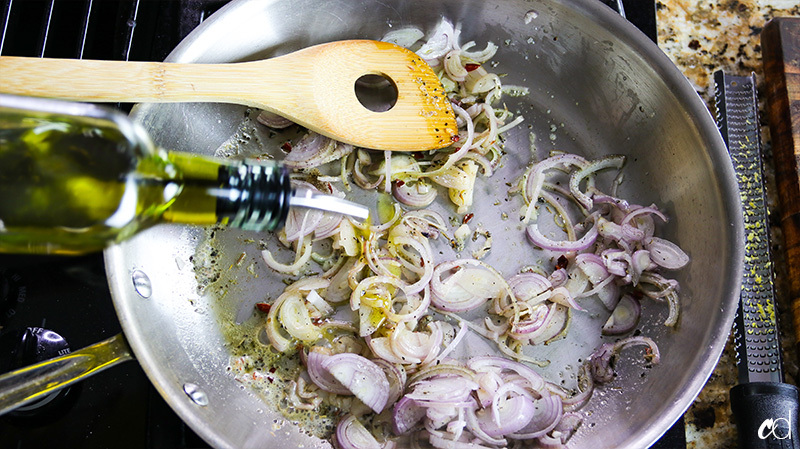 You may have to add additional olive oil or butter during this process to keep the aromatics well-lubricated. 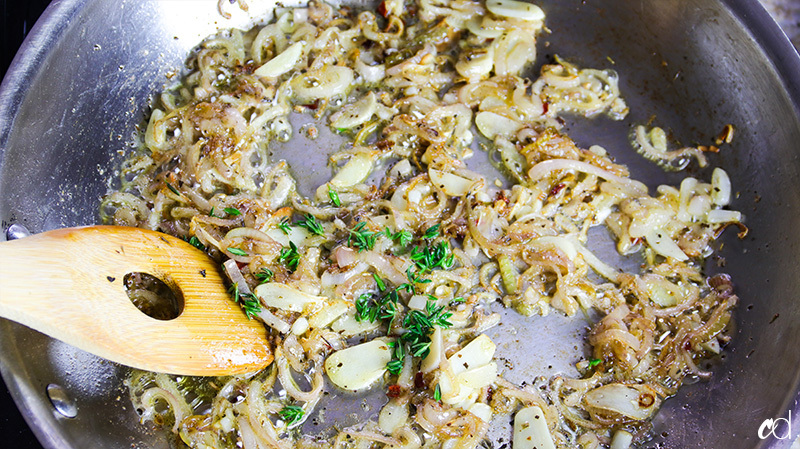 If your shallots and/or garlic is browning too quickly, simply reduce the heat. 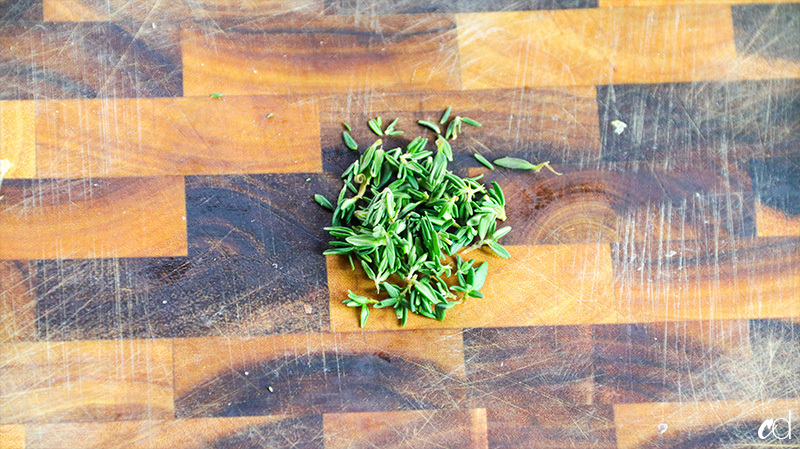 Toss in the fresh thyme, and stir around for about 10 seconds. 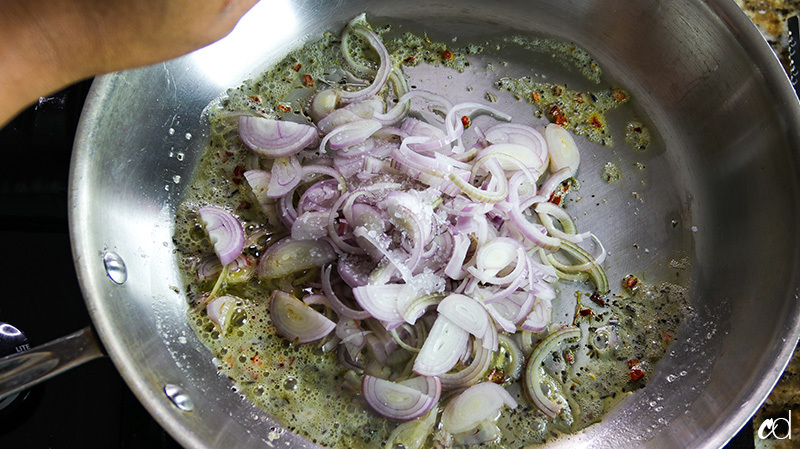 Be careful with this step, fresh herbs react to hot oil/butter and splattering can happen. Pour in the white wine, scraping up any bits that may be on the bottom of the pan. Reduce the heat to medium-low and allow the wine to reduce just slightly, about 2-3 minutes. Again, if your wine is reducing too quickly, lower the heat. Add the heavy cream, and stir to combine. 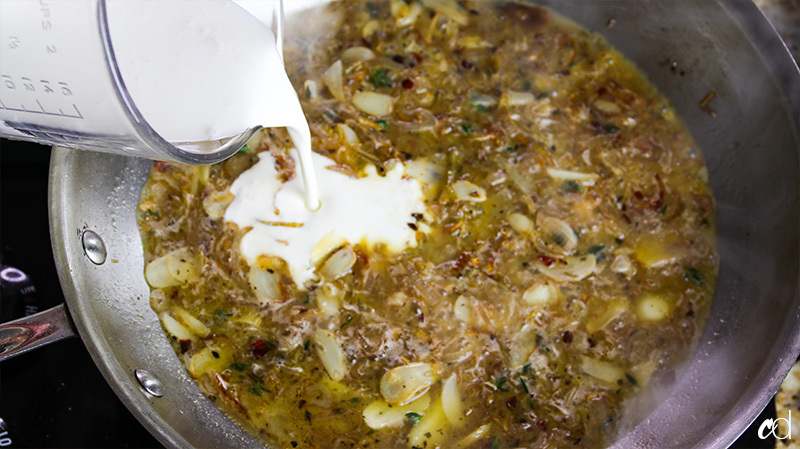 Allow the mixture to come to a gentle simmer, then reduce heat to low. 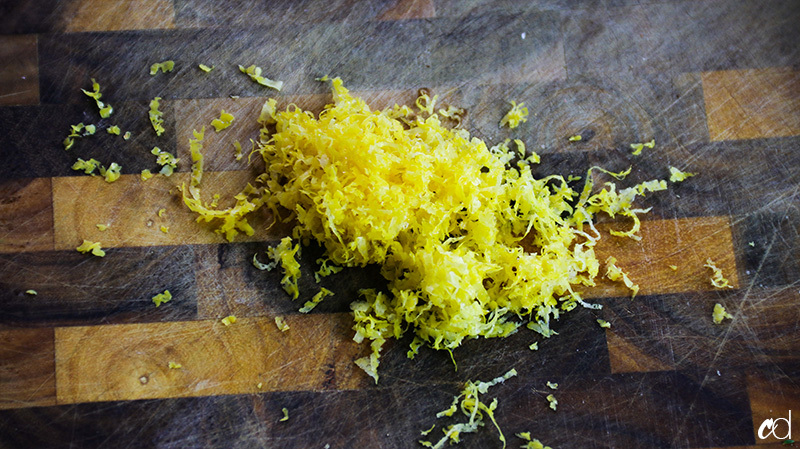 Add the lemon zest, and season with kosher salt and black pepper. 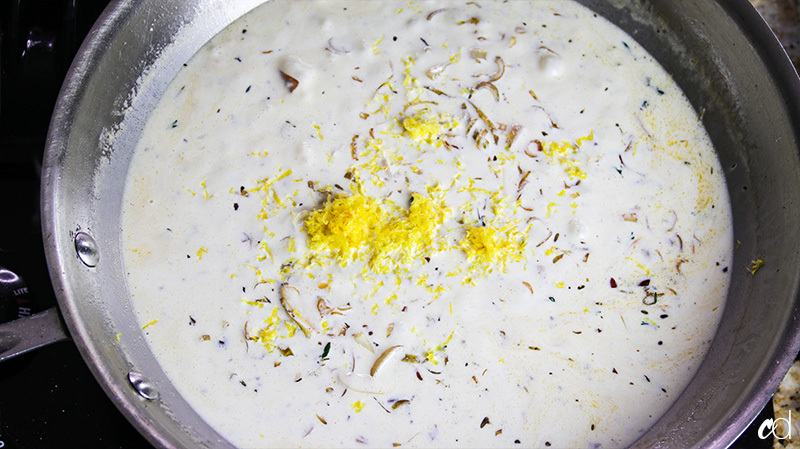 When the mixture is smooth and creamy, add the lemon juice. Stir to combine, taste and adjust seasoning. When it’s perfect, turn off the heat and serve with the chicken. About 15 minutes before the chicken is done roasting, start working on the cream sauce. Hunty. Lemme tell you! I made this dish tonight and it was EVERYTHING! Because I am vegan, I subbed with Earth Balance butter, coconut milk and gardein chick’n breasts / filets – and it was just amazing. Even my picky fiance asked me to pack him some for lunch tomorrow (and he never packs lunches, let alone never eats leftovers)! You the real MVP boo! Can it be made with breast meat or thighs? Yup, but you’ll have to adjust cooking times for white meat. Sis! This is a blessing in the belly! I made this for the first time tonight it was so simple to follow along and it came out great! I just loved the sauce I feel like it can be used on a variety of things. I am definitely keeping this one in my receipe box. 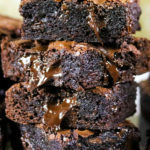 Made this recipe tonight and it was truly delicious. The ingredients and steps to follow weren’t overwhelming; shopping for the items were fairly easy as well. Today was one of those days I wasn’t feel well but I was determined that I didn’t want to eat garbage for dinner and I wanted my meal to taste amazing; my husband loved it. My daughter “5” didn’t eat it but she said she wasn’t hungry (lol). I paired it with seasoned white rice and roasted broccoli. Made this dish again, because it’s just so good. 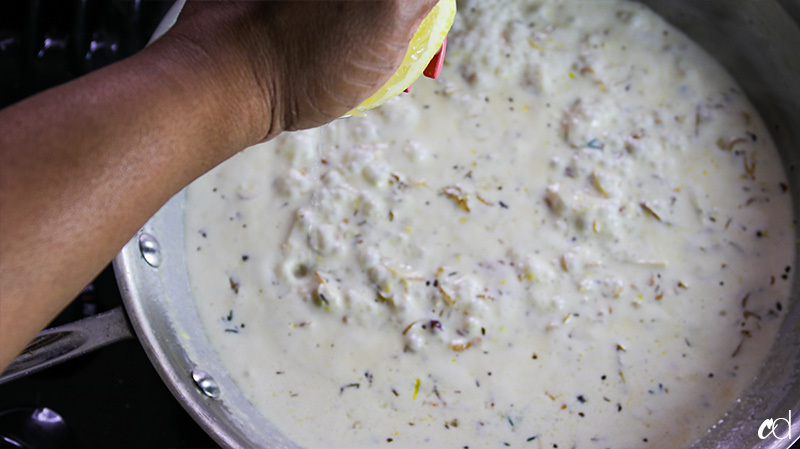 This time, I scooped up the minimal drippings from the chicken pan (minimal b/c removing the fat really reduces the grease) and added the drippings into the cream sauce. I left out the salt; I have blood pressure issues, so I stay away from adding salt when cooking. It was still divine nonetheless. Bomb! Great job chef! Absolutely delicious! Babaaaayyy. Let me tell you! This here is a dish and I am now apart of cult Herbs De Province. Thank you for the wonderful recipe. I paired this with a homemade Mac & Cheese and asparagus. Thank you for this blessing. I feel like a Chef! 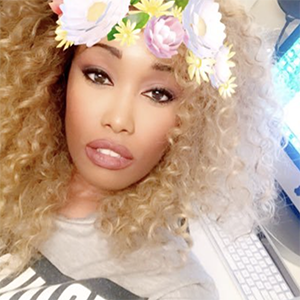 I shouted you out on pinterest and plan to shout you out on my blog!